Construction continues on the Northern Marmara Highway. When completed, the third Bosphorus bridge will become the widest in the world and the longest with a rail system. 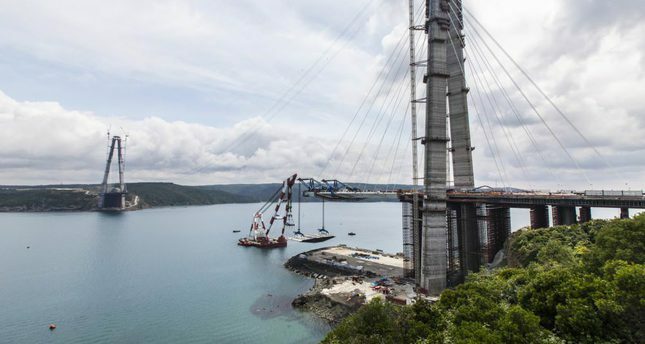 The construction of Istanbul's third Bosporus bridge and the Northern Marmara Highway is close to completion, with a catwalk that will be used to span the main cable between the two towers of the bridge having been completed this week. Some parts of the Northern Marmara Highway have been asphalted and made ready for travelers as well. Meanwhile, work continues incessantly to complete viaducts, underpasses and overpasses as part of the project that was started in 2013 and cost $3 billion. The third Bosporus bridge, called the Yavuz Sultan Selim Bridge, will unite the two sides of the Bosporus for the first time with the installation of a messenger between the two towers. The European and Asian sides of Istanbul came together for a third time after a catwalk that will be used in the installation of a main cable spanned the two sides. It was reported that employees and engineers can now cross the bridge by foot. The cable distribution saddles and cable rings of the towers were produced in Italy and transported to Turkey by ship. After all of them are installed on the top of the towers, the main cable will be strung through. Meanwhile, 18 steel bridge floors on which vehicles and trains will pass were brought by sea and installed. A total of 60 out of 176 curved steel suspension cables that will carry bridge floors have also been set up. The main carrier suspension cable will be built after 20 bridge floors are mutually installed on both sides. The steel bridge floors that will carry vehicles are being produced in facilities in the districts of Altınova and Tuzla and brought by ships. It is reported that the main cable was produced abroad, transported to Turkey and is being kept in a storage site until it is installed. Additionally, 102 culverts, six underpasses and one overpass have been completed as part of the Northern Marmara Highway Project, while work on the construction of 31 viaducts, 20 underpasses, 29 overpasses and 35 culverts continue. As part of the project, the drilling work in the Riva and Çamlık tunnels has finished and infrastructure work is continuing. Moreover, the highway construction work on sections of the project that pass though the villages of Kısırkaya and Çiftalan have been completed and asphalted. The work on the cross road in the Odayeri district that will connect the Northern Marmara Highway to Istanbul's third airport, which is still under construction, is continuing at full pace. Thousands of employees and engineers work ceaselessly 24 hours a day in the construction of the Yavuz Sultan Selim Bridge, which is 59 meters wide and is poised to be the widest bridge in the world. The total length of the bridge is 2,164 meters. The bridge, which has a length of 1,408 meters over water, has eight lanes of highway and two lanes of railway. It will be the longest suspension bridge in the world that features a rail system. The height of the tower in Garipçe village on the European side is 322 meters and the other tower in Poyrazköy district on the Asian side is 318 meters high. The bridge will be the highest in the world in terms of the height of its abutments. The rail system that crosses the bridge will run from Edirne to İzmit, will be integrated into the Marmaray and Istanbul Metro and will connect Istanbul Atatürk International Airport, Sabiha Gökçen International Airport and the third airport. The Northern Marmara Highway and the third Bosporus bridge are being built using a build-operate-transfer model.